The Texas Bullion Depository is the only state-administered precious metals storage facility in the country. It offers the ultimate peace of mind for your tangible assets portfolio, including 100% all-risk insurance on deposits.You can learn more about the Texas Bullion Depository here. The parent company of U.S. Gold Bureau operates this one-of-a-kind facility under contract for the state of Texas, which gives our clients easy access to all the services of the Texas Bullion Depository. For a limited time, the U.S. Gold Bureau will cover your storage fees for up to 12 months. You can request a withdrawal from your Texas Bullion Depository account at any time and have your metals shipped back to you or liquidate them through our firm for cash at the market price. Offer valid on phone orders only. Call our Texas Storage Packages Hotline to discuss your options and place an order at (800) 775-3504. Free storage offer is fulfilled through an account credit on an approved Texas Bullion Depository account after a deposit has been processed. Order must contain only gold coins or bars and all items in the order must be deposited. The offer is intended to cover the setup fee and storage fees for the time period indicated, based on a value of the initial order. Orders of $30,000 to $99,999.99 qualify for an account credit of $125 (bullion-only order) or $200 (qualifying diversified order). 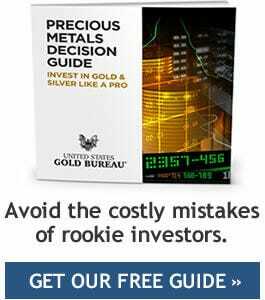 Orders of $100,000 or more quality for an account credit of $300 (bullion-only order) or $550 (qualifying diversified order). The credited amount may cover more or less time than indicated in the offer, since your storage fees are contingent on the actual amount deposited and the daily market price for precious metals. See the Texas Bullion Depository website for full details of storage fees that would be applicable to your account. Storage at the Texas Bullion Depository is open to all U.S. citizens or legal residents and requires the establishment of an official account. The standard rate to continue storage at the depository beyond the promotional period is .5 percent of the asset value per year. Ask your Account Executive about qualifying Investment Grade Coins. Offer must be claimed at the time of purchase. Other restrictions or conditions may apply.